Webcomic Underdogs is an arts and entertainment website/forum founded by Marisa Brenizer and Michael Yakutis. The site is dedicated to the discussion of all subject matter related to webcomics and building community between webcomic creators. It began as a Facebook group in 2012 and moved to its own domain in 2013. One of the main features of Webcomic Underdogs is a weekly Spotlight, for which members may submit their webcomic. Spotlight includes open critique from other members, an interview, promotion of the webcomic, and some fanart from the founders and other members. Webcomic Underdogs also has some blogs, a live chatroom, and a forum. The site can be visited here . A Day in the Limelight: This is essentially what the Spotlight is, giving a creator a chance to get feedback on their work while having it cross-promoted over Facebook and DeviantArt. April Fools: The members have participated in April's Fools switcheroos since 2013, in what looks like becoming an annual event for comics subscribed to the site. Bilingual Bonus: Theres a Spanish thread in the forum and several members have their webcomic available in more than one language. Exactly What It Says on the Tin: Its a community for indie webcomic creators. Fan-Art: Including the Spotlight, many of the members create fan art for each other for holidays or just for the fun of it. 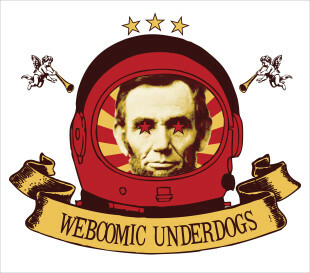 Recycled In Space: The mascot of Webcomic Underdogs is Space Lincoln. He even has his own ask blog. Shout-Out: Several of the site members make cameos of other Underdogs characters in their own webcomics. Theres even a thread in the forum to keep track of them all. True Companions: The site really encourages people to build relationships and support each other. Webcomics: The main topic of the site, naturally.